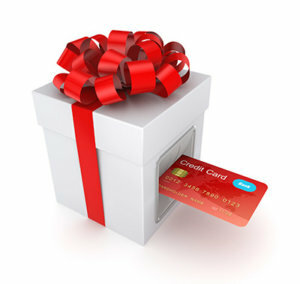 Avoiding making a credit card mistake can get harder during the holiday season. The decorations, music, and festivities of the season can sweep away our will power and cause us to be more generous with our gifts than we can really afford to be. To keep your credit card spending under control and protect your financial information, you must be smart about how you use your credit cards to pay for purchases. Here are some common credit card mistakes to avoid this holiday season. Many people do not realize that they are making a serious credit card mistake and putting their credit information at risk every time they enter the information when using an unsecured wireless network or website. Hackers frequently exploit these methods of accessing the internet to capture your information while its being transported unencrypted from one party to another. Many people choose to limit their online shopping to Amazon, eBay, and the websites of major retailers because they know that their payment information will be encrypted, making it harder for hackers to steal it. If you are unsure of whether a website you are using has been secured, look for a little lock symbol to the left of the web address or for the web address to start with https:// instead of http://. During the holiday season, many people whip out the credit cards for multiple payments a day, often spending more than they realize. If you make the common credit card mistake of neglecting to track of how much you are spending while you are spending it, you may find yourself unpleasantly surprised when you receive the bill in January. There are several ways to keep track of the amount you are spending during the holiday season. Some people jot the vendor and amount in a notebook they carry with them while others use budgeting apps like Mint to categorize their purchases as they are made. Keeping the amount you have already spent at the forefront of your mind will help you avoid overspending this holiday season. Another common credit card mistake often made during the holiday day season is purchasing gifts that require a recurring payment billed to you or charged to your credit card and not considering that additional cost in your budgeting. For example, when I purchased a new video game system for my son last Christmas, I factored in the cost of a couple of new games and an additional video game controller but did not consider that I would need to pay a monthly fee for an online membership so he could access all of the features of the games he would play. People that purchase smartphones, membership packages, and video games with multiple tiny toy characters that interact with the game find themselves in the same position. Be sure to consider all of the costs involved before making your purchase. Oh — don’t forget the biggest issue which is overspending!!!! !